For all the radios listed below, I have documentary evidence that they were either explicitly intended for use with Siemens-Halske "Presse Hell" printers (e.g., based on marketing brochures and advertising), or were actually used in combination with such printers. Note that the Hellschreiber system does not require any particular type of radio receiver. However, the "Presse Hell" printers (models T.empf.12 and T.empf.14) do not include electronic circuitry. They require an external detector/amplifier unit to convert the Hell tone-pulses received via radio (or phone lines), to DC-power pulses to energize the solenoid (electromagnet) of the printing mechanism. Some of the radios listed below actually include such a unit, specifically for Hell-printers. 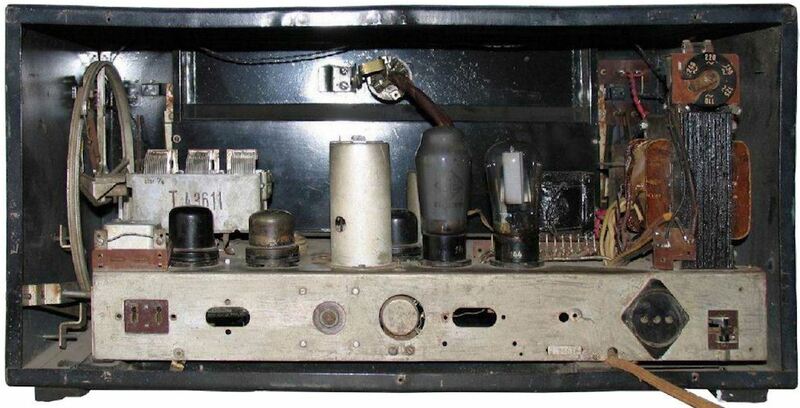 Most of the listed radios were designed and manufactured by Telefunken, not Siemens. However these two companies were very closely linked. The Telefunken history dates back to 1903, when Emperor Wilhelm II instructed the Gesellschaft für drahtlose Telegraphie, System Prof. Braun und Siemens & Halske m.b.H. (S-H) and the Allgemeine Elektrizitäts-Gesellschaft (AEG) to form a joint-venture, to pool their patents and R&D efforts. 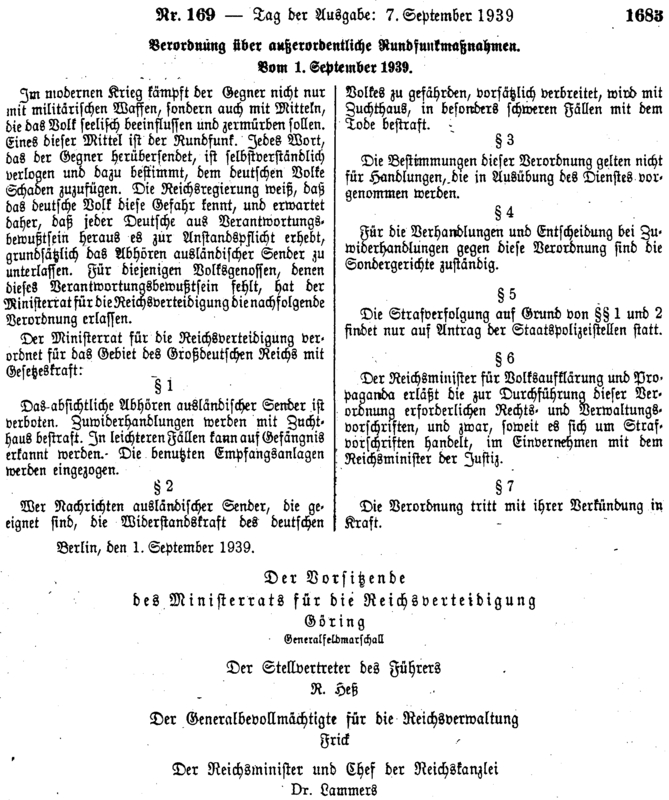 This company was called the Gesellschaft für drahtlose Telegraphie m.b.H., System Telefunken. Ref. 1, 2. It had the telegraph address TELEFUNKEN, which became the company's trademark and later on its name. As the name clearly suggests, the main activities were initially related to spark transmitters. Based on its many patents, Telefunken was able to establish a monopolistic position in the vacuum tube industry. They developed an estimated 75% of all tubes manufactured in Germany up to 1945. 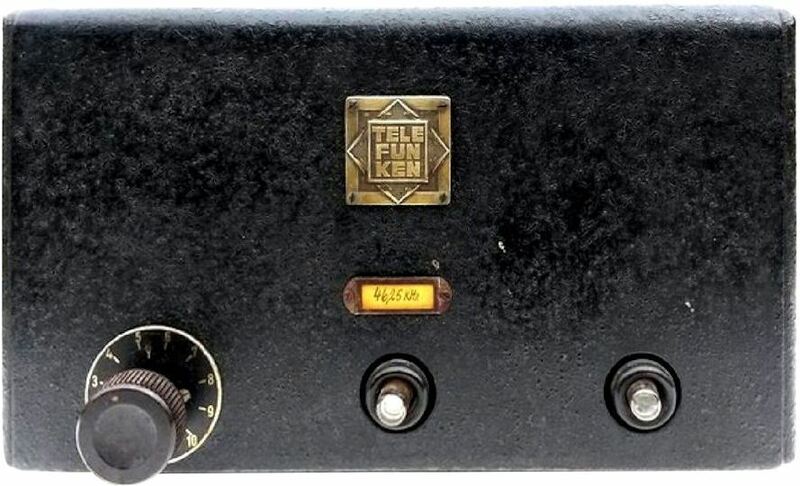 In October of 1941, Telefunken became wholly owned by AEG. 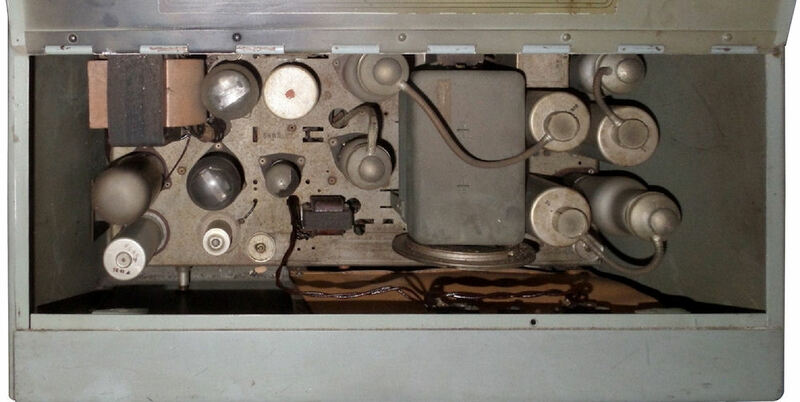 The "E 376" is a receiver for a single frequency ("Einkanalempfänger", "Festwellenempfänger"): at the factory, fixed-value capacitors were used to tune the receiver to a customer-specific frequency in the 60 - 200 kHz (longwave) range. Ref. 6. This is why the unit has no frequency scale or frequency tuning knob. The receivers has five tubes: two RE 074, two RE 034, and one RE 124. All are triodes. For frequencies below 75 kHz, the RE 074 tubes were replaced with RE 084 tubes. All tubes have a 4-volt heater filament. The unit is battery-powered (anode and heater), so as to be independent of the power grid. 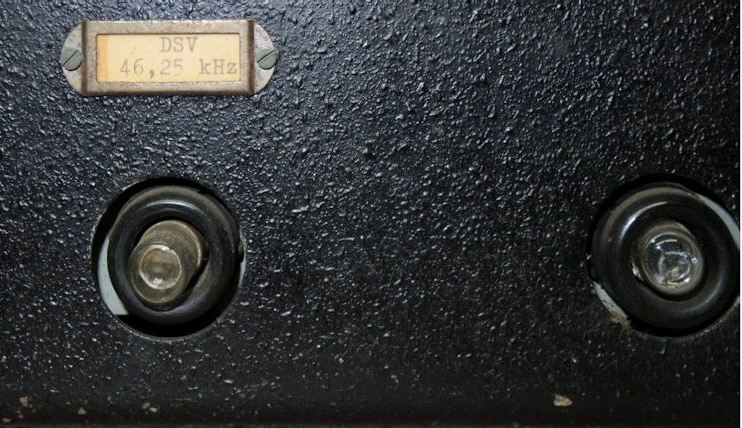 In 1937, this radio could be had for a mere 395 Reichsmark (ref. 5) - nearly 3 months salary of an unskilled worker at that time (see the Hell-equipment prices page). The unit measures 46x20x19 cm ( ≈18x8x7.5 inch) and weighs 3.9 kg ( ≈8.6 lbs). The frequency range is determined with a set of coils. The sets are easily exchangeable. A special external coil-set box was available, to cover the entire 42-451 kHz range. Note: the "Rö" part of "E 415 Rö" stands for "Röhre(n)": German for vacuum tube(s). Fig. 5: Telefunken model "E 415 Rö"
Output power: 90 volt at 4000 ohms = 2 watt , sufficient to directly energize the AC-powered printer solenoid of an early model "Presse-Hell" printer (i.e., without an additional keying-amplifier). 6x CF7 pentode (in the HF, IF, BFO stages); this type of tube dates back to 1934. Ref. 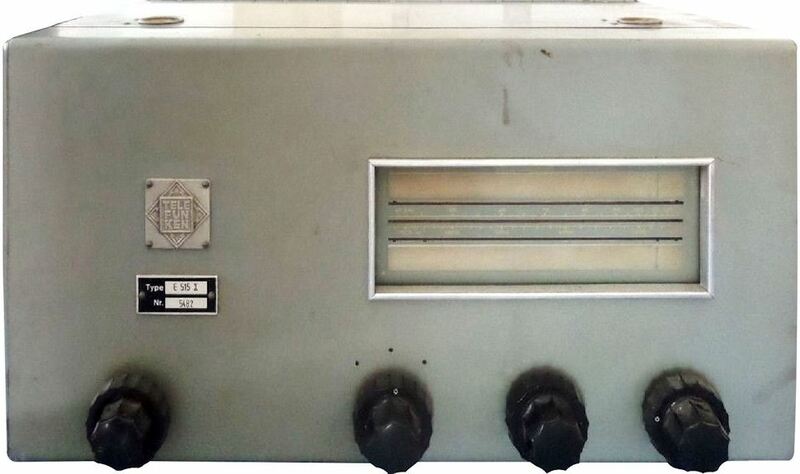 5 suggests that this expensive radio (1200 RM in 1937, several months salary for an average skilled worker at that time). For that lofty price, the power-supply was included, but not the vacuum tubes! The "E 38" is a direct-conversion receiver (no intermediate frequency). It also has a BFO (D: "Überlagerer"), so it is suitable for receiving both un-modulated and modulated telegraphy (Hell or "Morse"). Frequency range: the available information that I have on this receiver does not state its frequency range - presumably long-wave. The frequency scale on the front of the unit is simply graduated from 0 to 100. 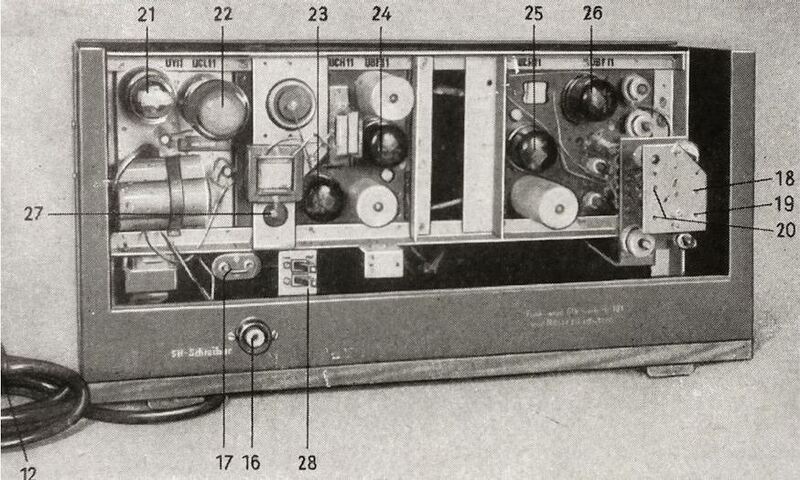 This suggests that several versions were available, as with the Telefunken "E 415 Rö" discussed above. 1x EU IX "Eisen Urdox" voltage regulator / current limiter. This is a Negative Temperature Coefficient (NTC) resistor, made of depleted uranium dioxide (ref. 14). This is actually not a radio tube, but a resistor sealed inside a glass tube. Until ca. 1934, Urdox resistors were exclusively made of uranium-dioxide and were (are) slightly radioactive, like glow-in-the-dark watch dials and hands made of radium. Starting 1944/45, magnesium-titanium-spinel was used, as it was easily manufactured from raw materials still available in Germany (unlike the "Auslandswerkstoff" uranium). LORENZ "LO 6 L 39"
Some ships of the Kriegsmarine (the German navy, 1935-45) also carried a Presse-Hell printer on board. For instance, the "Prinz Eugen" (a heavy cruiser of the Hipper Class) had one such printer in the battle communications room (Gefechtsnachrichtenzentrale, GNZ), i.e., not in one of the ship's three radio rooms! Ref. 15, 16. On this ship, it was used in combination with a Lorenz Lo 6 L 39 longwave receiver. 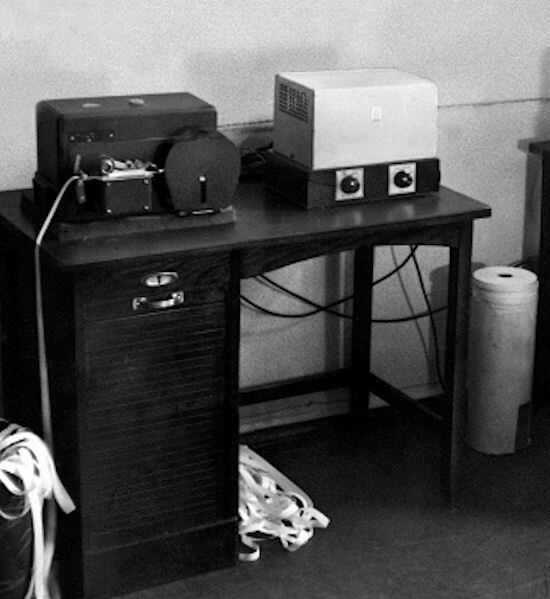 The signal intelligence service of the Kriegsmarine also had Presse-Hell printers (as well as Feld-Hell machines), e.g., at the monitoring station near Neumünster (ref. 16). 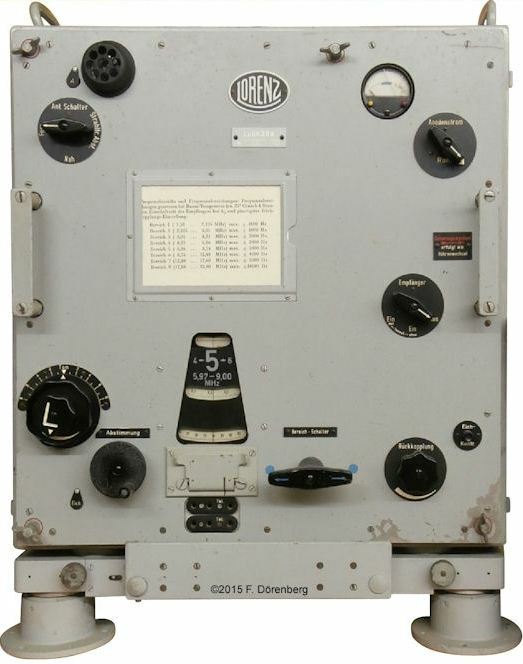 The Kriegsmarine designator for this receiver is EO3750. In the model designator "Lo 6 L 39", Lo = Lorenz, 6 = six tuned stages, "L" = "Langwellen" = longwave, 39 = 1939 = the year of entry into service. Fig. 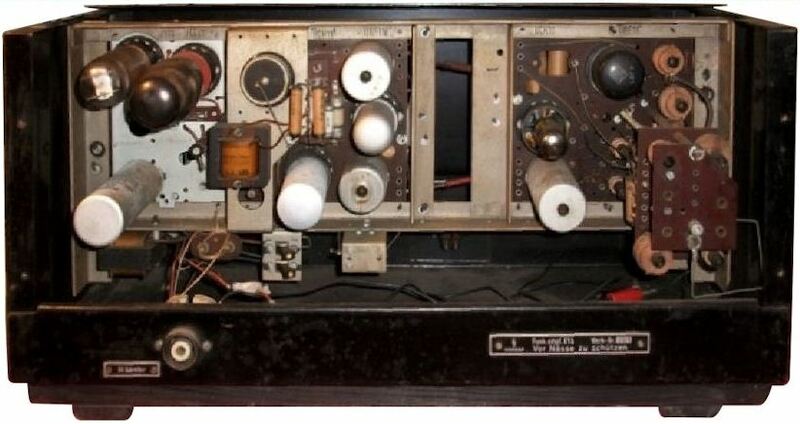 15: Lorenz "Lo 6 L 39"
The receiver covers the frequency range of 75 - 1599 kHz with 8 bands. It comprises the following tubes: 6x RV 12 P 2000, 1x Te 30, 1x STV 159/20. It has a BFO, so it is suitable for modulation types A1, A2, and A3 (CW, MCW, AM). Model Lo 6 L 39 has mica capacitors, whereas the Lo 6 L 39a has ceramic capacitors. The unit measures ca. 50x32x54 cm (WxDxH, ≈20x12.6x21.3 inch) and weighs 65 kg (≈143 lbs). Ref. 17. 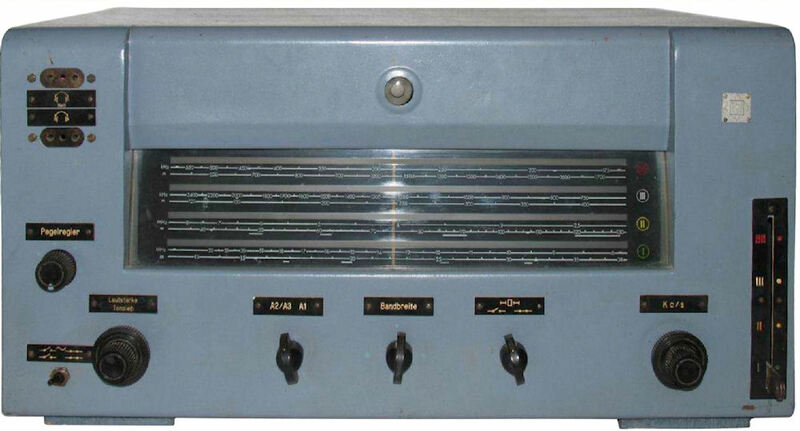 The standard Telefunken receiver model E 407 Rö is a 5-tube / 5-stage AM/CW regenerative receiver ("Geradeausempfänger"). A special version of this receiver has an additional 1-tube audio amplifier stage, for driving a Hell-printer/teleprinter. Fig. 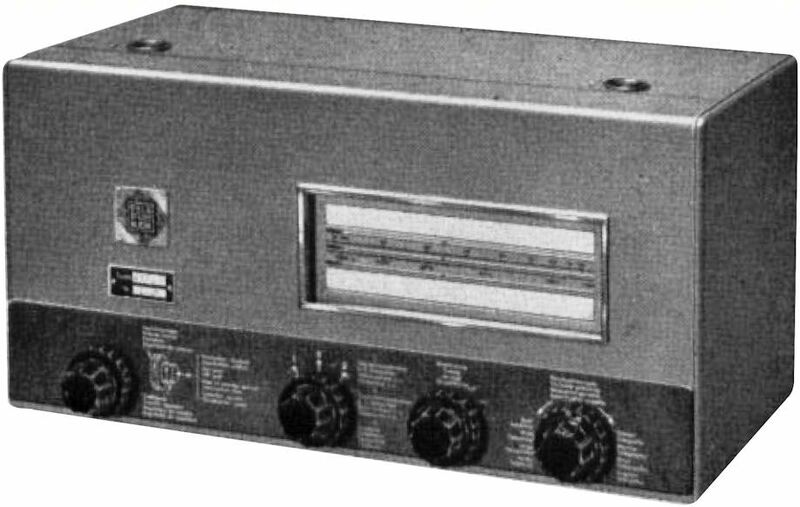 18: Telefunken "E 407"
Frequency range: 75 - 750 kHz and 1.5 - 3.0 MHz, four bands in total. "RES" = Röhre (vacuum tube) Empfängerröhre (radio receiver tube) Schutzgitterröhre (screen-grid tube, tetrode); the R-series tube numbering scheme (3 or 4 letters) was used for tubes developed through ca. 1933.
provided by an external power supply or batteries; noise suppression choke coil in series with each power line. 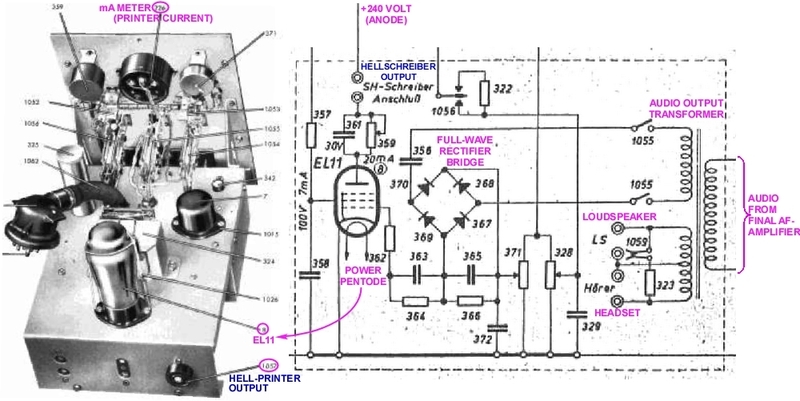 "the most modern method of sending messages fast and error-free: the Siemens-Hell-Schreiber"
This receiver includes detector and amplifier circuitry with sufficient power to directly energize the AC- or DC-powered printer solenoid all "Presse-Hell" printer models. Fig. 19: Telefunken "E 515 X"
A Telefunken DC-AC inverter ("Wechselrichter") of type WR 3 could be used for operation with DC mains power(110 or 220 VDC in, 110-150 VAC out). This inverter is basically an electro-mechanical chopper ("Zerhacker" with extensive line-filtering on the input and after the output transformer. Ref. 21. The WR3 measures 36x16x9 cm (WxHxD, ≈14x6.5x3.5 inch) and weighs 4 kg (≈9 lbs). Price: 60 Reichsmark in 1939/1940. Used with headsets model "EG 420"
Fig. 21: front of an "E 515 X"
Model Ae 1047 is an "Allwellenempfänger" ( = general coverage receiver) for A1/A2/A3 modulation (unmodulated & modulated CW, AM). It covers 150 kHz - 22.2 MHz with four bands. The receiver comprises 8 tubes (EF13, ECH11, EBF11, EL12, EF11, AZ12) and an EM11 "magic eye" tuning indicator. It has a BFO and manually variable IF-bandwidth. It does not have a built-in loudspeaker. 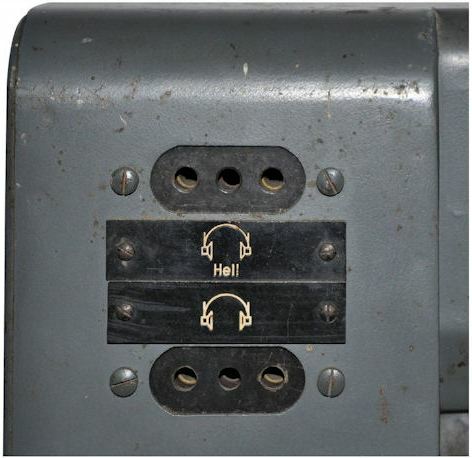 The rear panel has outputs for a 3000 Ω monitoring loudspeaker ("Kontroll Lautsprecher"), and a "Hell Tastgerät (20 Ω)" keying device. It also has an input for a gramophone record player ("Tonabnehmer"). It has a wooden housing and operates on 110/125/150/220/240 volt AC (selectable), 50-100 Hz. 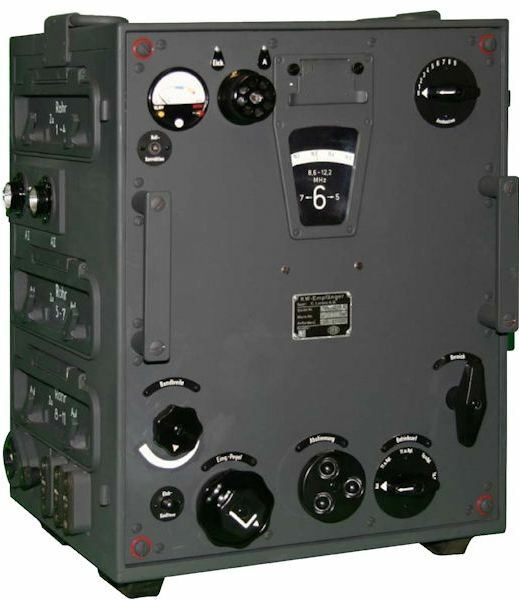 The unit visually resembles the Telefunken Super-Ela 1012a/b receiver (AM only) that was used by the Kriegsmarine. 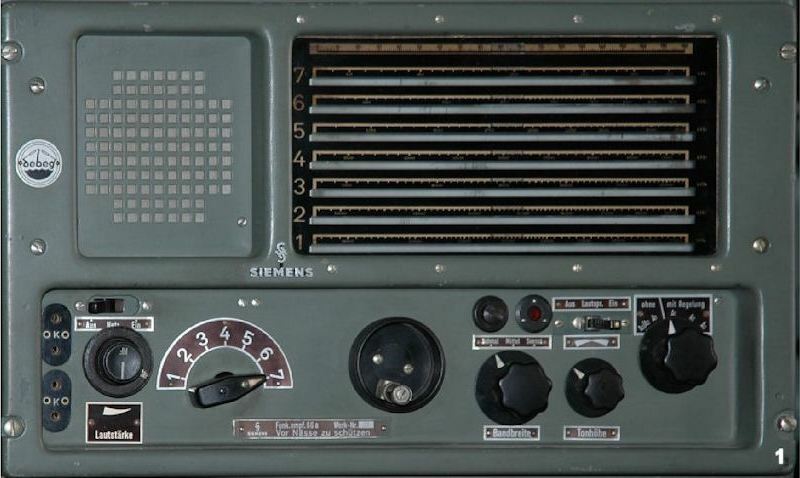 The "499" radio set was manufactured by Minerva-Radio of Vienna/Austria, but marketed and distributed by Siemens-Halske. Minerva-Radio Co. was originally named Minerva, Radiola-Radioapparate und Bestandteile W. Wohlleber & Co., and was founded in 1919 in Vienna/Austria. 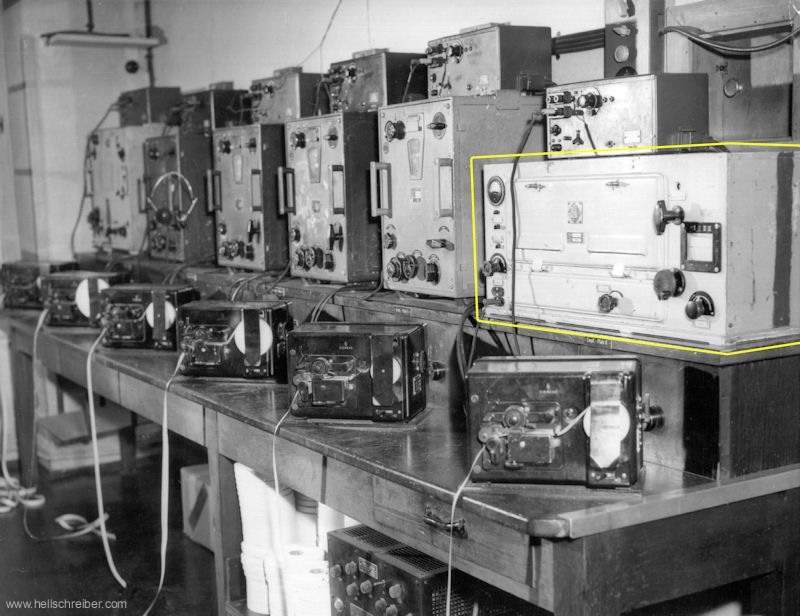 Already before WW II, some of their radios were built under license in Switzerland, Italy, France and Poland. It became part of Grundig in 1968. 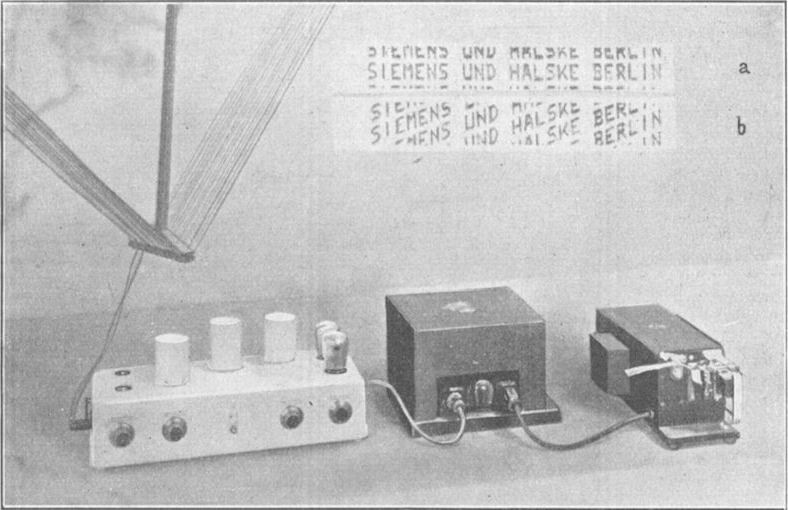 The label on the back of the radio and the Siemens-Halske product brochure (ref. 22) clearly state that the "499 SH" was built specifically for Siemens-Hellschreiber - hence the "SH" in "499 SH". Fig. 27: the Minerva "499 SH"
Modulation types: A1 (un-modulated CW/Hell telegraphy), A2 (modulated CW/Hell telegraphy), and A3 (AM voice/telephony). 1x EW 499 SH current regulator/stabilizer. Apparently, this part was specifically made for the "499 SH"! It is used to stabilize the heater-current of the vacuum tubes in oscillator/BFO circuitry. The "EW" part of the part number indicates that it is an Eisen-Wasserstoff-Widerstand (iron-hydrogen resistor). It looks like a neon light bulb with a heater filament. For operation on a 12 volt car battery, Siemens sold a DC-AC converter of type ES GUR 12/250/2. 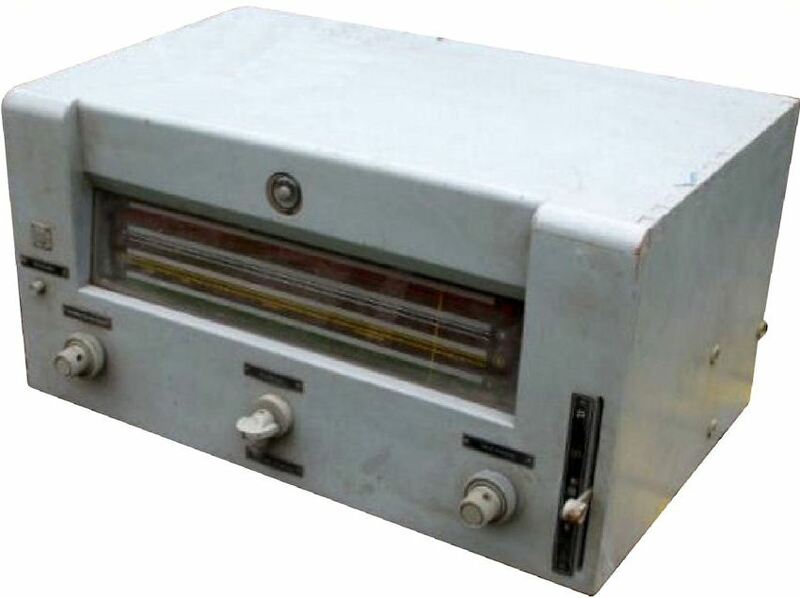 This unit provide DC voltages for the vacuum tubes (anode, heater filament, grid-bias). The radio has a 12-pin connector on the back for the supply voltages (AC voltage + ground, 2 pins each, or three DC voltages, 2 pins each). The photo immediately above and below show a separate chassis-module on the far right. This module is for the detector/amplifier stage for the Hell-printer (as well as for the receiver's BFO). In the photo above, the EF11 vacuum tube is missing. As shown in Fig. 32 and 33, the circuitry for the "Hell" detector/amplifier is located on a separate chassis module. The schematic of the detector/amplifier is quite straightforward (ref. 22, 22A). The receiver has a two-stage audio amplifier, comprising a dual-diode-pentode of type EBF 11, followed by an EL 11 power/output pentode. The anode of the latter is connected to the output transformer. The transformer has two secondary windings. There is a tapped winding for a 3 ohm loudspeaker and a 2000-4000 ohm headset output. A separate winding coupling the audio to the Hell-printer circuitry. This circuitry comprises a full-wave rectifier bridge with four Siemens cuprous-oxide-on copper diodes of type G 0711/15. The output of the rectifier is filtered. When Hellschreiber tone pulses are received, equivalent DC-pulses appear at the rectifier output. These pulses are amplified with another EL 11 power/output pentode. The one side of the Hell-printer is always connected directly to the 240 volt DC anode voltage of the receiver (do not touch that connector pin)! When receiving a pulse, the EL 11 actually pulls the other side of the printer solenoid down to a low voltage. Printer current is adjusted to the standard 20 mA, and can be verified with a mA-meter on the front of the unit. Figure 33 above shows a 12-pin connector plug (far left). The shell of the plug actually has a German WW2 military designator: FL 32619-1. The mating 12-pin jack is located on the adjacent main chassis. On the back of the main chassis (see Fig. 25 and 27 above), there is a similar 12-pin male jack. All these 12-pin connectors and their inserts have the Siemens part-number "Type 77 ale 6H" or "6S". It appears that that model "499" was built in two versions: "499 SH" for the military market, and "499 GW" for the civil market. I do not know the differences between them, nor what "GW" stands for. Both versions were introduced in 1941. Note that Siemens & Halske was 50% owner of the Telefunken Gesellschaft für drahtlose Telegraphie m.b.H. 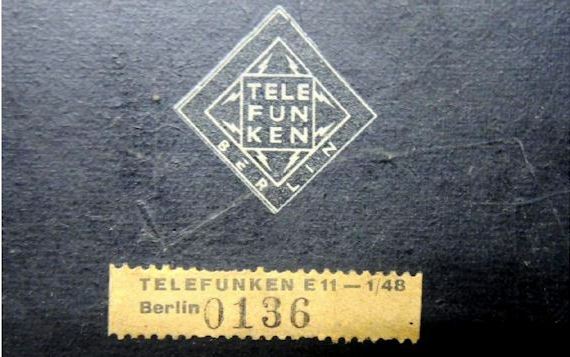 (Telefunken for short), until its partner Allgemeine Elektricitäts-Gesellschaft (AEG) bought them out on 24 September 1941, and Telefunken continued as a subsidiary of AEG. During the transition period, the non-Siemens & Halske part of part of TFK did not agree with, as witnessed by an internal memo from October of 1941 (ref. 43). 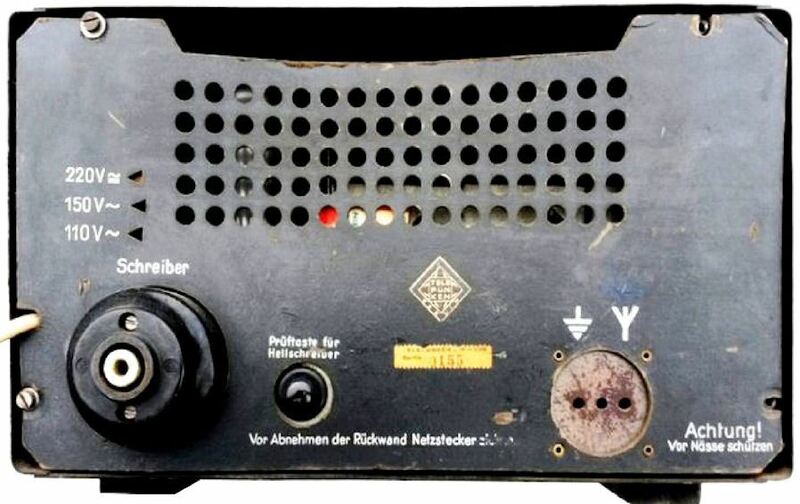 It became known that the German DNB news agency and the Waffen-SS reported that Siemens & Halske was selling a new, “very inexpensive” receiver with a very large band coverage (9-6000 m; 50 kHz - 33 MHz) and a built-in Hellschreiber printer amplifier. The receiver was being built by the Minerva company in Vienna/Austria. This broadband solution was considered to be wrong, and the undersigned would not support it. The planned receiver should be OK for long-wave ( = DNB news cast) but a higher quality receiver ( = low temperature drift) would be required for shortwave. Also, for VHF (above 30 MHz), diversity reception capability was deemed indispensable for long-range. 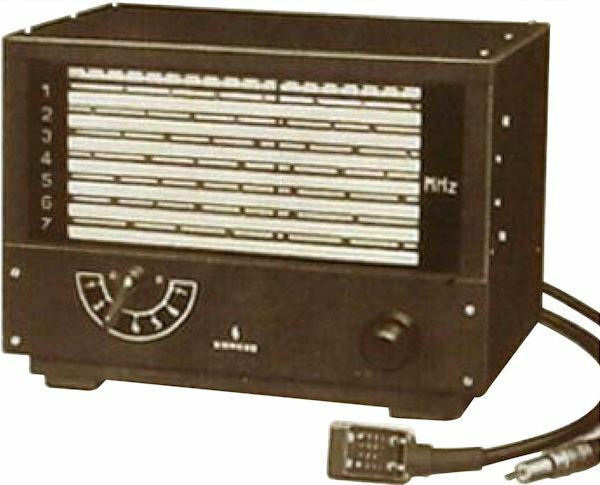 The Ln 21021 is an 8-band shortwave receiver (1.5 - 25 MHz), built for the Luftwaffe in 1941/1942 at various locations by the C. Lorenz A.G. company. The prefix "Ln" refers to "Luftnachrichten", the Air Signal Corps. It was used in fixed-base and mobile operations (vehicles). About 1000 units were built. 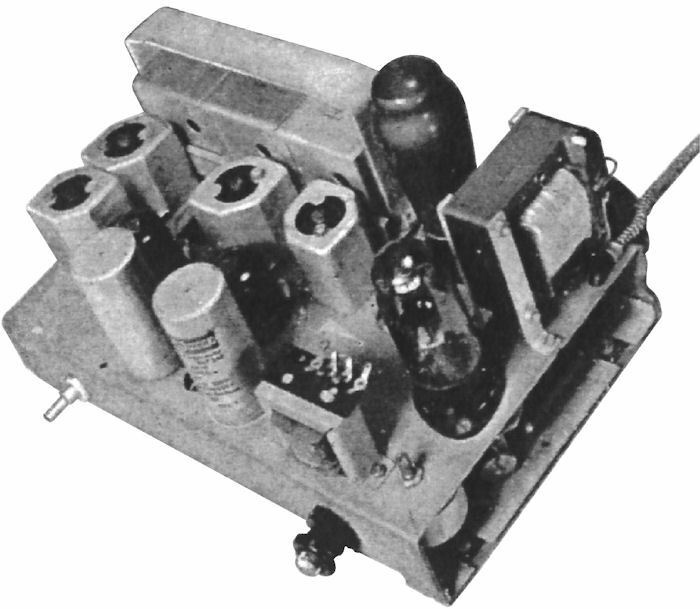 This receiver is also known as the "Schwabenland". Ref. 24, 25. The Kriegsmarine used an identical receiver, with the designator EO 8268. Fig. 37: shortwave receiver Ln 21021 "Schwabenland"
This single-conversion receiver has two RF-stages and three IF-stages. The gain of the first RF amplifier can be controlled manually. The second RF stage has automatic gain control (AGC). Between the mixer and the first IF stage, there is a crystal filter with continuously variable bandwidth (200-5000 Hz). The IF frequency is 1.24 MHz. A crystal-controlled oscillator provides a fixed BFO signal of 1241 kHz, and also functions as crystal-based marker generator for calibration purposes. The receiver is suitable for A1 telegraphy ("Tg. "), and A2/ A3 telephony ("Tf.") modulated signals, selectable with or without AGC ("Rgl. ", Regelung): AM, CW, and MCW. The receiver comprises 11 tubes of type RV 12 P 2000 (universal pentode), as well as an STV150/20 dual "Glimmspannungsregler" glow-discharge voltage regulator, and a Te 30 "Glimmstabilisator" glow discharge stabilizer for overvoltage protection at the antenna input. Contrary to receivers with a (much) more advanced design, such as the famous E 52 "Köln" and the Mw.E.C, the "Schwabenland" uses the RV 12 P 2000 tubes in a "single function" manner, instead of cleverly using each single tube for two or three functions. The set measures 34.5x44x 30.4 cm (WxHxD, ≈13.5x17x12 inch), weighs about 40 kg (≈88 lbs), and is operated off selectable 110/112/150/220/240 volt AC power, 40-60 Hz, 33 VA.
After World War 2, some of these receivers were used by German news agencies such as DPD, in combination with a Presse-Hell printer. Ref. 26, 27. This receiver only has a 600 ohm phone-line output and a 4000 ohm headphone output, so a keying amplifier had to be used for the Hell-printer (visible in the photo below, on top of the radios). 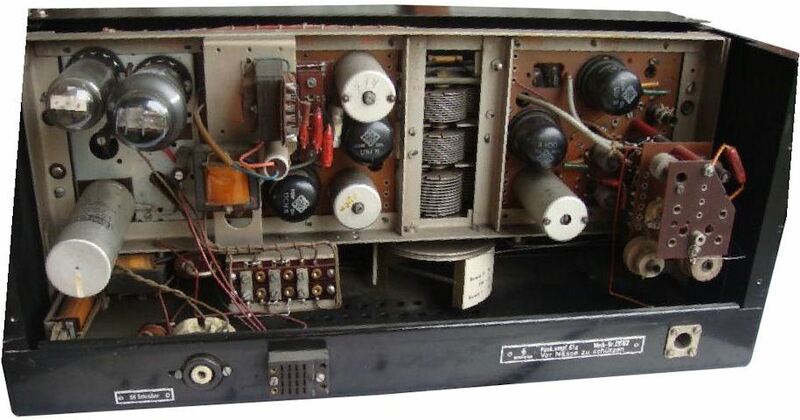 TELEFUNKEN "AE 1076 / AE 1085"
The Ae 1076 is a specialized communications receiver. Like model Ae 1047 it is an "Allwellenempfänger" ( = general coverage receiver) for A1/A2/A3 modulation (unmodulated & modulated CW, AM). It covers the frequency range 171.5 - 566 kHz (one band) and 706 kHz - 23.6 MHz (divided into three bands). Ref. 29. It came on the market in 1938. Fig. 39: label of an "Ae 1076"
Fig. 40: front of the "Ae 1076"
Fig. 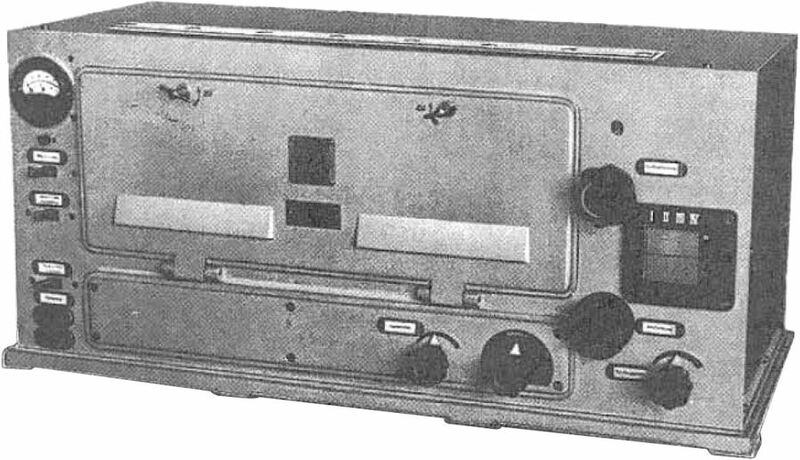 41: rear of the "Ae 1076"
Version 3 ("Ausführung 3") of the Ae 1076 includes the optional module Az 1085. 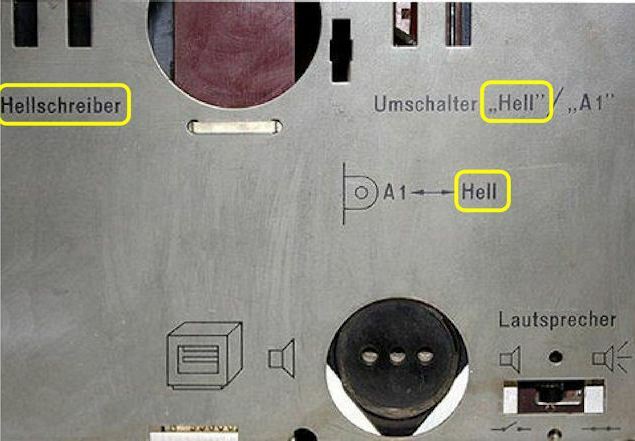 This is a Hellschreiber-Zusatzgerät (Hell accessory) that converts received Hell tone-pulses into DC pulses, that are output to a Presse-Hell printer. This module comprises a full-wave rectifier bridge (four diodes) and one vacuum tube of type EF 12 (AF pentode "Stahlröhre"). 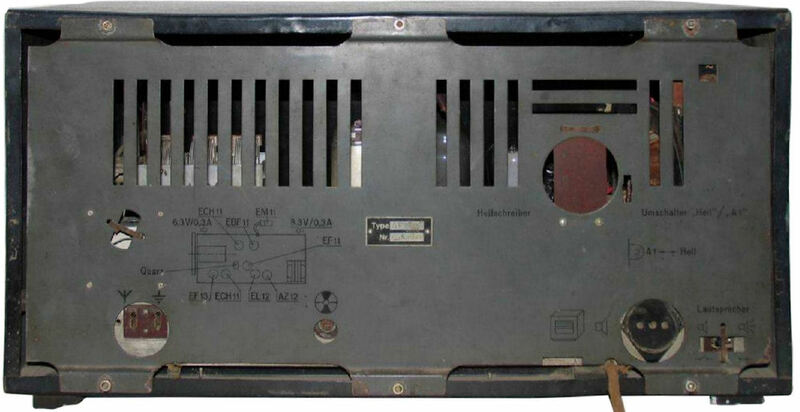 The photo below show the area of the Ae 1076 rear panel that is reserved for the Az 1085 and the associated 7-pole switch and connector. Ref. 29, 29A. 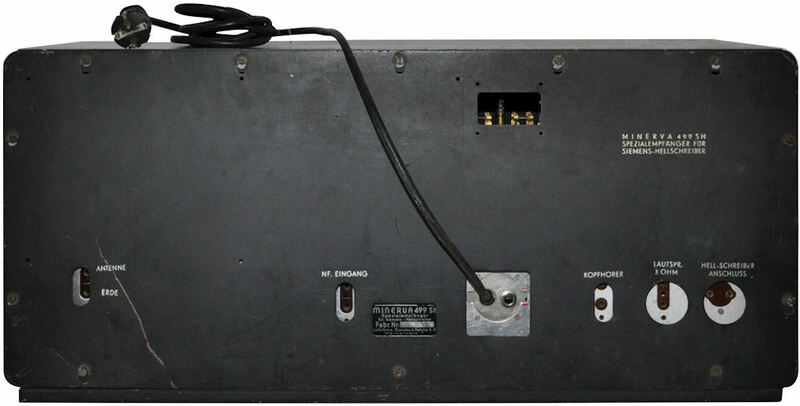 SIEMENS-HELL "FUNK EMPF 61 / FUNK EMPF 62"
The Funk empf 61 is a longwave telegraphy receiver from ca. 1946. It was specifically developed for use with a Siemens-Hell (SH) printer. Therefore, it has a built-in detector/amplifier that delivers 20 mA printer current. Siemens also sold an accessory for the Funk.empf.61: the Funk.empf.62 (described further below). This unit converts the shortwave frequency bands to a fixed frequency (1.2 MHz), that can be received by the Funk.empf.61a. For pricing information about the Funk.empf.61a and 62, see the "Hell-equipment prices" page. Model a: two bands (40-90 kHz, 90-200 kHz) plus one fixed frequency (1.2 MHz, to serve as IF for the matching Siemens general-coverage shortwave down-converter Funk.empf.62). Model b and c: three fixed Hellcast frequencies (Reuters, DENA, and DPD). Model h: two bands (40-90 kHz, 90-200 kHz). This is a simplified model "a": no 1.2 MHz and no knob for adjusting the BFO frequency. I do not know the differences between model b and c, nor am I aware of the existence of models d - g.
The following 6 vacuum tubes are used in the Funk.empf.61 receiver: 2x UCH 11 (triode-hexode), 2x UB F11 (double diode pentode), 1x UCL 11 (AF-power-triode), and a UY 11 (half-wave rectifier). Interestingly, this is the same set of tubes as used in the Telefunken (!) Presse-Hell receiver EPH/L/2. The receiver has a BFO (on longwave, almost all data transmissions were done as "A1" un-modulated CW), and automatic gain control (AGC). It requires 220 volt AC or DC ("Allstrom"), 55 watt. Connections are for an antenna, ground, headphones, a Hell-printer, and a printer current meter. Fig. 49: rear of a "Funk.empf.61a"
Fig. 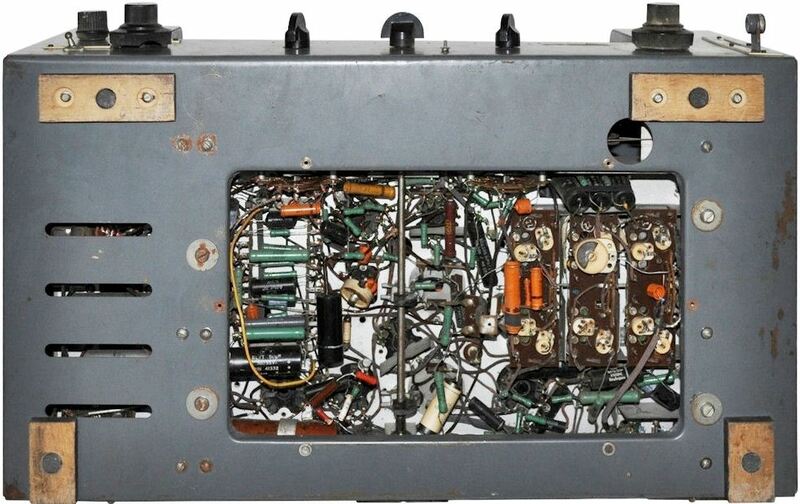 51: front of a "Funk.empf.61b"
Model 61b has three selectable fixed frequencies (3-position selector at the top left). Hence, there is no frequency tuning knob, nor a frequency dial. Fig. 53: rear of a "Funk.empf.61b"
Fig. 55: front of a "Funk.empf.61h"
Fig. 56: detail of the front of the above "Funk.empf.61h"
On the rear of the unit, there are connectors for the Presse-Hell printer output (standard round Siemens "OD" teleprinter jack), power, printer-current meter (used for adjustments of the quiescent current of the UCL 11 final amp tube, upon replacing the tube), antenna and ground. 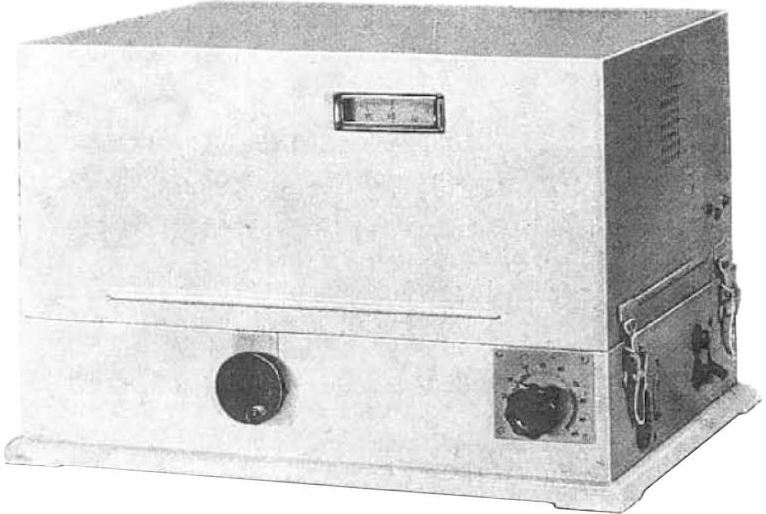 The Kurzwellen-Vorsatzgerät T.empf.62 is a shortwave down-converter. It is placed between the antenna and the T.empf.61 longwave receiver. It covers the frequency range of 4 - 26 MHz with seven overlapping bands. Each band is converted to a particular frequency in the range covered by the T.empf.61. The latter acts as first IF for the down-converter. Fig. 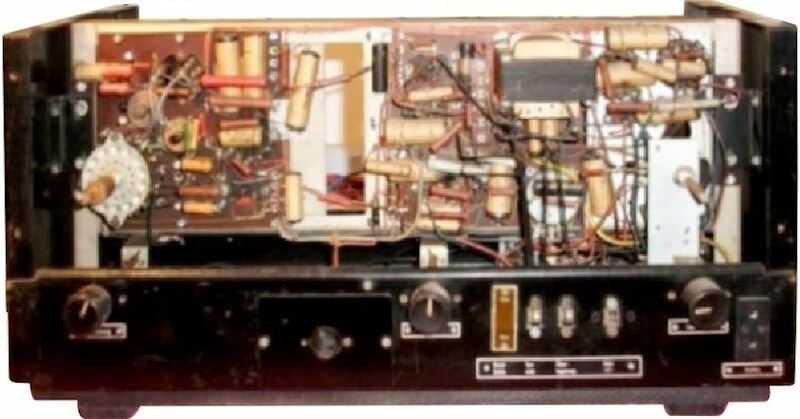 57: shortwave down-converter "Funk.empf.62"
Wired broadcast actually preceded wireless broadcast. E.g, Tivadar Puskás in Budapest/Hungary operated his "Telefon Hírmondó" pay-radio service via the telephone system in 1893: 26 years before the world's first regular radio broadcasts by Hanso Schotanus à Steringa Idzerda in The Netherlands. 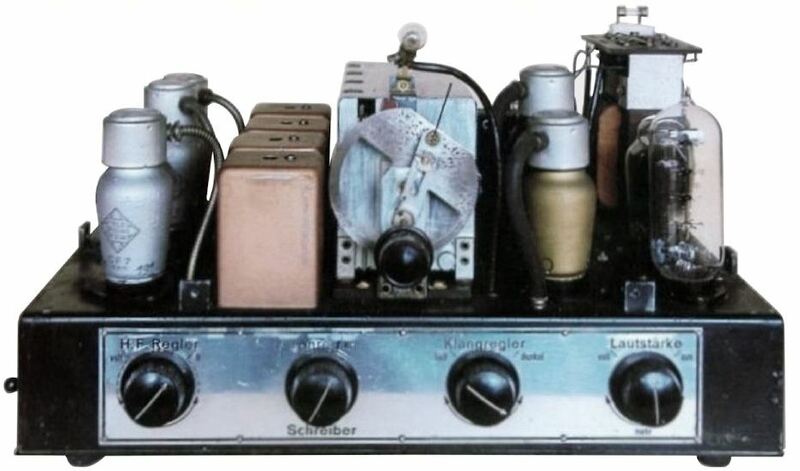 Both HF-modulated and base-band (broadband-AF/LF) Drahtfunk existed. The latter dates back to the mid-1920s and has very limited range (still used in hospitals, hotels, etc.). Note that in Germany (as in the UK) "Drahtfernsehen" (cable-TV) also dates back to the second half of the 1930s! The original purpose was to provide interference-free broadcast via the widely available telephone network. Another "advantage" was that the government had full control over which stations the subscriber-population could listen to, and the content of the broadcasts. During the WW2, there were nearly 180 thousand subscribers in Berlin, Hamburg, and Düsseldorf. In some regions, the system was used as part of the civil defense system ("bomber alert"), because broadcast radio transmitters were shut down during alerts, such that enemy aircraft could not use the transmitters for radio-navigation ("homing"). Also see ref. 44. HF-Drahtfunk was primarily done on longwave frequencies (e.g., 150-430 kHz, 160-270 kHz, or 250-300 kHz), but also in the medium-wave band (around 1.2 MHz, MW). 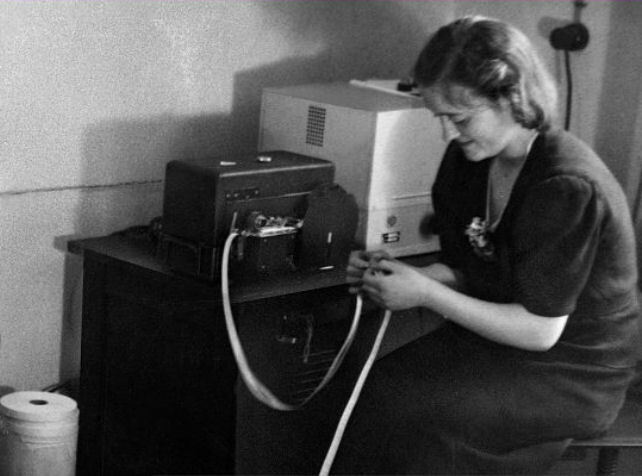 In post-war West-Berlin, 224 kHz /NWDR), 255 kHz (RIAS), and 265 kHz (Berliner Rundfunk) were used. Both AM and FM versions existed. For HF-Drahtfunk via the telephone lines, the subscriber had a small splitter/filter unit. 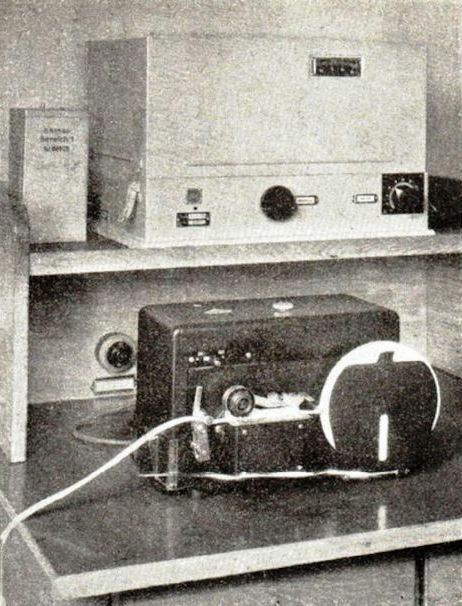 Both the telephone and an LW/MW radio receiver were connected to it. For HF-Drahtfunk via the public power network, the radio's antenna input was capacitively coupled to a power outlet. Some broadcast radios had a special Drahtfunk frequency (or band) marked on their dial. Ca. 1948, Siemens-Halske developed the general-coverage receiver model Funk.empf.66a. This model is also referred to as Funk 745 E 302 und E 66 a. It covers 120 KHz through 27 MHz, divided into 7 bands. Ref. 34. Other than the Telefunken EP/H/L2, this is the only radio on this page that has a built-in loudspeaker. Bandwidth is selectable between narrow (+/- 125 Hz, for telegraphy), medium (+/- 2800 Hz), and "distress" (+/- 12500 kHz). With the bandwidth-switch in the latter position, the radio is automatically tuned to the (old) international marine distress frequency (500 kHz). Fig. 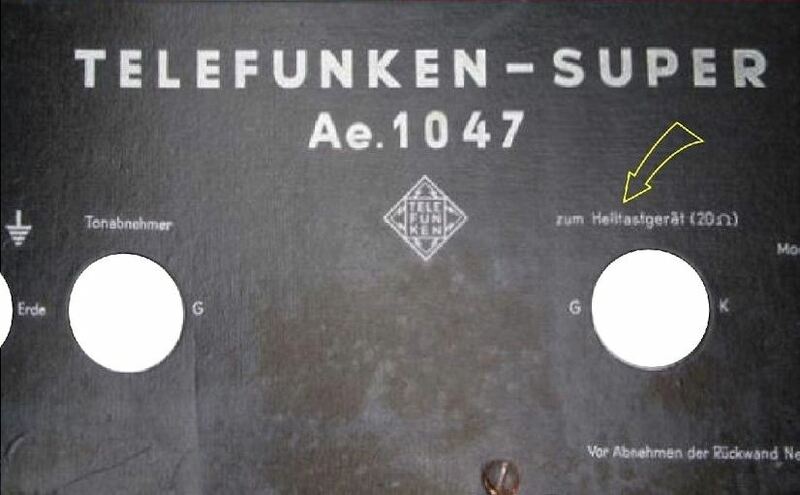 61: the Siemens "Funk.empf.66a"
As the model number suggests, Presse-Hellempfänger E11-1/48 (in some literature denoted E 11/1/48) dates back to 1948, and was manufactured in 1948 and 1949. It was developed in close cooperation with news agencies (ref. 36). 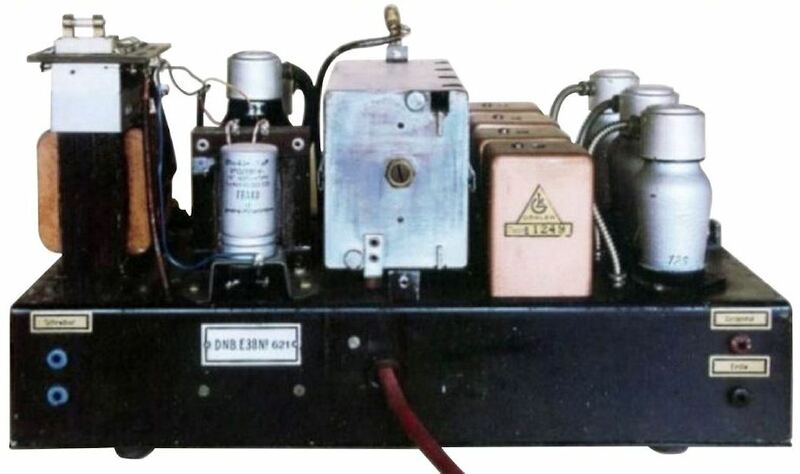 The E 11-1/48 is a 3-tube / 4-stage AM regenerative receiver ("Geradeausempfänger") for a fixed frequency in the 40-150 kHz long-wave band. 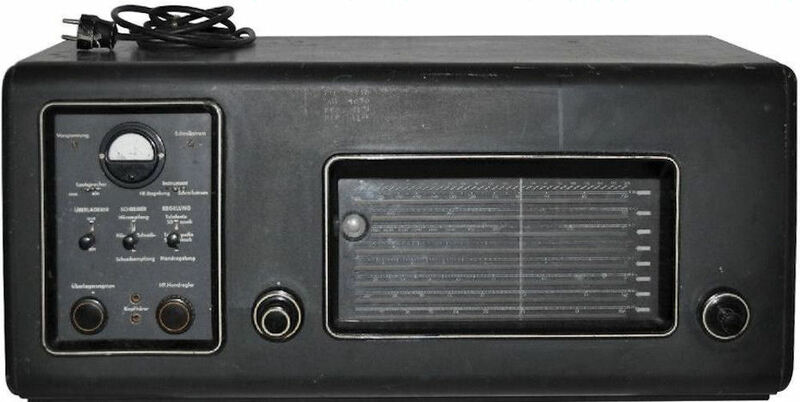 As it was used for the dedicated frequency of a particular news agency, this radio does not have a frequency tuning knob or scale, nor a loudspeaker. Frequency is changed by plugging in a different capacitor block. The block has one section per tube, and each section contains at least one fixed capacitor and one trimmer capacitor. As no tuning is possible, all four receiver stages are temperature-compensated to 50 ppm/ºC. It has a 500 Hz bandwidth. Half-wave rectification in the detector and the AGC circuit is done with a "Kupferoxydulgleichrichter". I.e., cuprous-oxide-on-copper diodes, such as the Sirutor diode used in the Feld-Hell machines. The anode current (20 mA max) of the final amplifier drives the solenoid of a Hell-printer. 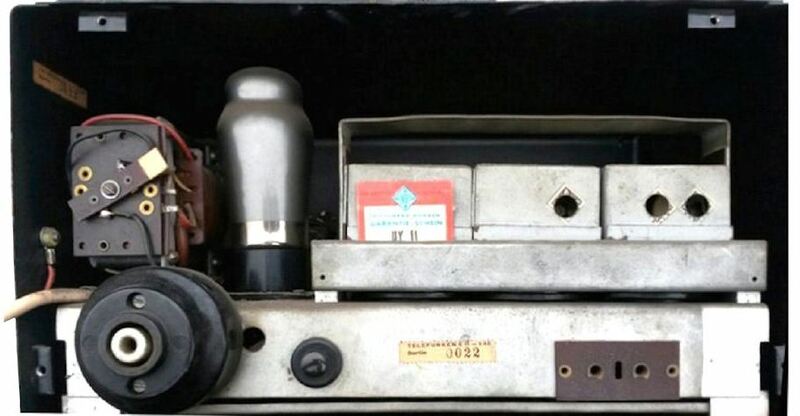 The receiver is a so-called "Allstromgerät": a unit that can be powered with 220 volt DC and 110/150/220 volt AC. The unit has a test button on the back, to send a 50 Hz pulse to the Hell printer (obviously, this only works when operating on AC voltage). Fig. 68: label on the rear cardboard cover of an "E11-1/48"
EPH/L/2 stands for Empfänger Presse-Hell / Langwellen / Version 2. That is: Presse-Hell receiver, longwave, Mk. 2. It was manufactured in 1949 and 1950. It is a slightly upgraded version of the E 11-1/48. This is a 5-tube / 5-stage heterodyne receiver that covers two frequency ranges: 40-80 kHz and 80-160 kHz. Heterodyne ("Überlagerer") receivers use a local oscillator (Beat Frequency Oscillator, BFO) and a mixer, to make on-off keyed unmodulated telegraphy pulses (A1 modulation) audible - in this case at 2.6 kHz. The intermediate frequency (IF) is 35 kHz. Receiver bandwidth is 300 Hz. The EPH/L/2 uses the same types of vacuum tubes as the T.empf.61. The receiver only has two outputs: headphone and a DC-current output for a Presse-Hell printer. The latter current (20 mA nominal) is passed through a mA meter on the front of the radio. There is neither an internal loudspeaker nor a loudspeaker output. Like the E11-1/48, it is an "Allstromgerät" for 180-240 volt AC/DC. It measures 41x22x24 cm (≈16x9x9.5"). Ref. 36-39. 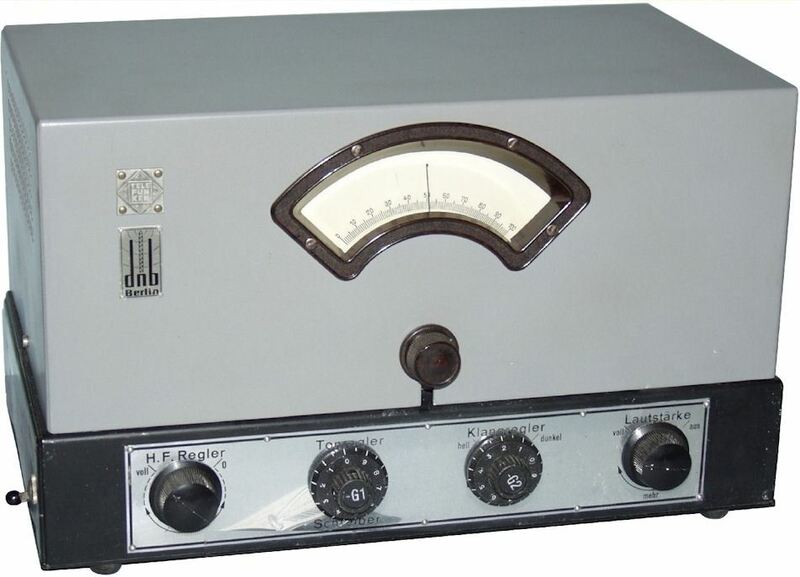 The German DPD news agency is know to have used this type of receiver to monitor its own Hellcast transmissions. Pricing information regarding the EPH/L/2 is provided on the "Hellschreiber-equipment prices" page. Ca. 1971 (!! ), the German news agency DENA developed a long-wave (LF) radio receiver, specifically for use with a Presse-Hell printer: the E 3 (ref. 40). It operates on a single frequency (46.25 kHz). This is the first - and only - such receiver that is fully solid-state (transistorized). The first production run was 80 units. Additional units were built thereafter, but the total production volume was quite limited. 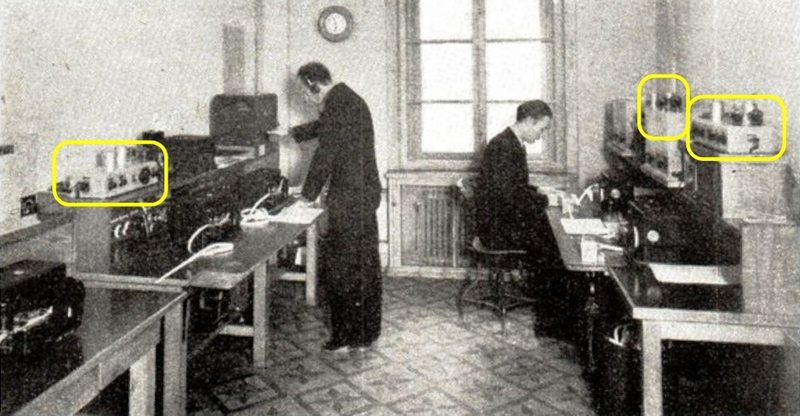 The radio was also used for "semi-legal" broadcast of the sports-channel of the "Deutscher Sportsverein" (DSV) sports network, and by associated betting offices. This is a receiver for A1-modulated Hellschreiber pulses. That is, simply an un-modulated "CW" RF-carrier that is keyed on-off. As this is not a broadcast receiver, it does not have an internal loudspeaker, nor an output for a loudspeaker or headphones. Hence, the A1-pulses need not be made audible, so the receiver also does not have a BFO (beat-frequency oscillator, "Überlagerer"). Board 2: IF filter, IF amplifier. The IF-frequency is 14 kHz. The internal power supply (220 volt AC, 50 Hz) provides three voltages: +6, +12, and +100 volt DC. The latter voltage is for driving the Hell printer-solenoid (25 mA max). There is a mA meter on the front panel, for checking the printer current. The radio has two antenna inputs: one for coax, the other for a high-impedance antenna. The only control is a potmeter (with switch) on the front panel, for automatic vs. manual RF gain. 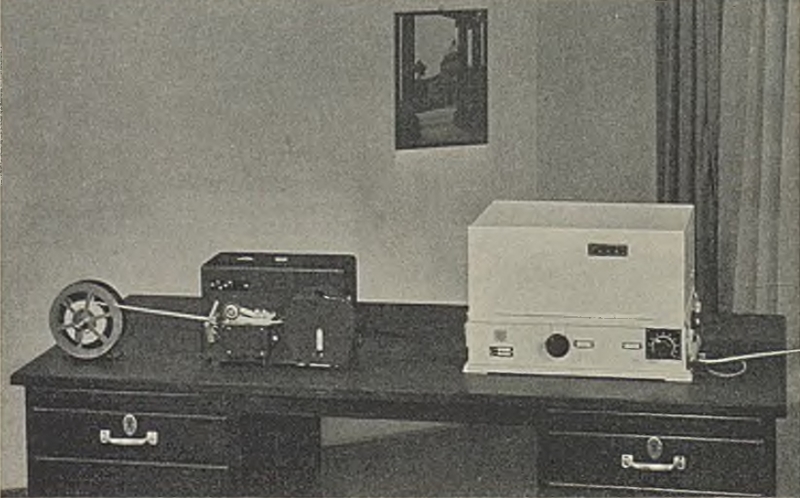 The photo below shows a Siemens-Hell printer model T.empf.14 with a T.verst.18 keying-amplifier and a Telefunken radio model that I have not yet been able to identify... If you know which model it is, please contact me. Ref. 3: "Voici "des machines à écrire" pour télégraphier soi-même de son domicile" [machines for teleprinting yourself at home], Paul Lucas, in "La Science et la Vie", No. 209, November 1934, pp. 406-410. Ref. 5: p.7 in "Siemens-Hell-Schreiber", Fernmeldetechnik, Siemens & Halske A. G., Wernerwerk, Berlin-Siemensstadt, 2. 37. 5. T., SH6592, 1937, 7 pp. Ref. 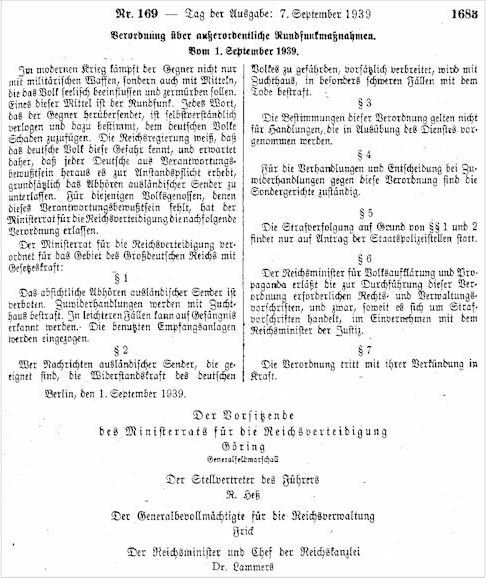 13: "Pressefunk - Schreibfunk: Einladung zur Vorführung einer Schreibfunk-Anlage", letter from the DNB branch office in Magdeburg, 1938, 2 pp. Ref. 12: "DNB-Presse-Empfänger für Telefonie und Telegrafie Type E 38", DNB product brochure, 4 pp. Ref. 14: "Urdox-Widerstände - Technische Verwendung" [technical applications], Wilfried Meyer, Archiv für Technisches Messen (ATM), Z 117-3, DK 621.316.86, October 1938, 4 pp. Source: www.cdvandt.org. Ref. 15: "Kreuzer Prinz Eugen: Unter 3 Flaggen", Paul Schmalenbach, Koehler Verlag, 1978, 240 pp. Ref. 16: "Ausstattung der Funkaufklärungsstelle Neumünster nach einer Liste des Oberkommandos der Kriegsmarine - SKL III in Flensburg-Mürwik im Mai 1945", p. 326 in "Blitz und Anker, Band 2: Informationstechnik, Geschichte & Hintergründe", Joachim Beck, 2005, ISBN 3833429976, 636 pp. Ref. 20: "Siemens-Hell-Schreiber", F. Berck, pp. 237-240 in "Elektrotechnische Zeitschrift (ETZ)", Vol. 61, Issue 10, 7 March 1940. Ref. 21: WR3 schematic in "Telefunken Werkstatt-Buch 1939/40", Telefunken, November 1939, 124 pp. Ref. 25: "Kurzwellenempfänger Ln 21021 (Schwabenland)" [pdf], Peter Treytel, October 2008, 37 pp. Ref. 26: pp. 18-9, 49, 68-70, 126 in "40 Jahre dpa, Deutsche Presse-Agentur GmbH", Hans Benirschke (ed. ), Hamburg 1989, 127 pp. Ref. 30: "Langwellen-Telegrafie-Empfänger (LT-Empfänger Funk empf 61)", company brochure, Siemens & Halske AG, SH 13, 10490,3 4859, 6 pp. Ref. 31: "Siemens-Hell-Technik", company brochure, Siemens & Halske AG, SH Nr. 725, 6 pp. Ref. 35: 10-December-1951 - price quote (incl. taxes, import duties 12-30%) from Nederlandsche Siemens Maatschappij NV in The Hague/The Netherlands to ANP news agency in The Hague, for equipment suitable for operation in the tropics: Hell tape-printer T.empf.14, sheet-printer 9T.empf.1a, longwave receiver Fu.empf.66a, longwave receiver Fu.empf.66a with built-in Hell-printer amplifier, longwave receiver T.empf.61a with built-in Hell-printer amplifier, stand-alone printer-amplifier St.verst.1a, new model printer amplifier (no model name). Volume discounts. Ref. 37A: EPH/L/2 schematic, Fig. 7 in ref. 37; note: the same schematic is shown in ref. 36 and 38, but the half-wave rectifier diode in the power supply is a UY11 (dating back to ca.1939) instead of a UY4 (ca. 1947). The UY11 has a higher heater-filament voltage (50 vs. 35 volt). Ref. 41: "Kurzwellenempfänger Ln 21021 Geräte-Handbuch" [Schwabenland], Druckschrift D.(Luft) T. 4415, August 1942, 38 pp. Source: www.cdvandt.org. Ref. 42: "Sechskreisempfänger Type E 407 Rö", Telefunken brochure, W.B.159D (2000), April 1936, 3 pp. Source: www.cdvandt.org. Ref. 44: "Wire program services of the Reichspost", J.A. Parrott, FIAT (Field Information Agency, Technical; United States Group Control Council for Germany) Final Report No. 290, 3 October 1945, 14 pp. ; source: cdvandt.org. Ref. 45: "Siemens-Hell-Schreiber", pp. 16, 17 in "F Sammelliste 1939" [Telecom products overview], Siemens Fernmelde Technik, Siemens & Halske AG, Wernerwerk, Berlin-Siemensstadt, 400 pp.